I like playing Kingsway at my day job. It's one of the few games that I can have running at full screen without anyone questioning my work ethic. 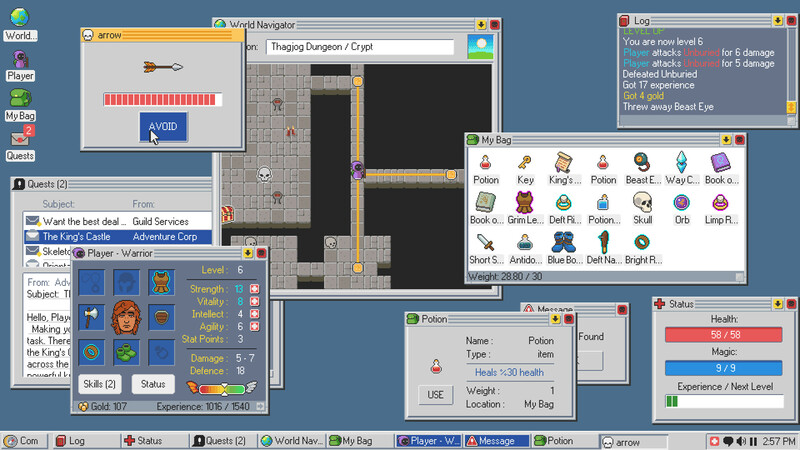 If a coworker or customer happened to glance at my computer screen, there's a good chance they'd assume I'm just some kind of weird Luddite, not an overworked blogger playing a surprisingly deep RPG disguised as a dated desktop interface. Now, I should say that I don't necessarily advocate playing video games at work unless your job is A) soul-crushingly boring or B) to literally play video games whenever you can. Between my Real Life job and Dtoid, I'm straddling both points and Kingsway is just too good to put down. Productivity, be damned. Kingsway's a funny little game. It's a rogue-lite spin on old-school RPGs. There's little in the way of fanfare; you create a character, select a class, and start your adventure. Like many of the early role-playing games it emulates, Kingsway trades narrative beats for the simple pleasures of looting and exploring. Speaking of emulation, that's Kingsway's schtick. The entire game looks like an archaic computer desktop. Quests will randomly pop up through an email client, and battles take place in small, moving windows. Despite its stylized, pixelated graphics, I found myself looking at Kingsway's in-game clock before panicking and checking my watch to see what time it really was. 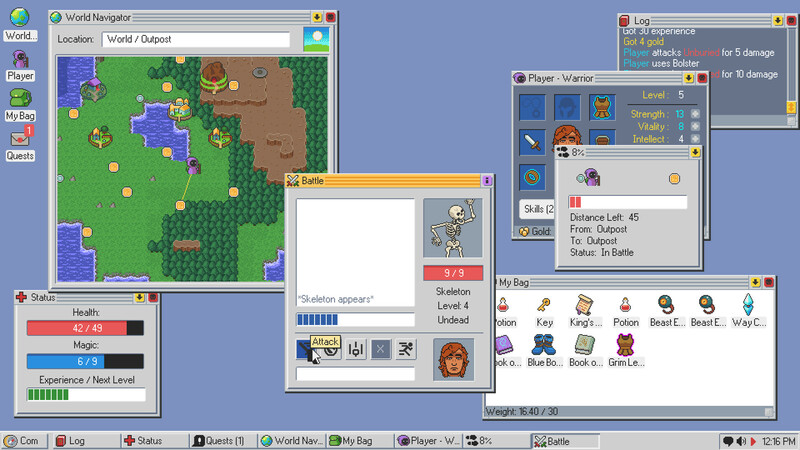 While it might not be immersive in the "AAA" video game discourse sense of the word, Kingsway commits to the retro desktop aesthetic in a way that's complete and satisfying. Since it released earlier this week, I've spent a few hours exploring the dungeons and outposts that litter Kingsway's map. It can be slow at times since movement is node-based. Once you select a destination, your avatar begins its march forward. In keeping with the computer-display vibe, there's a loading bar that pops up to convey the distance between two points. Fortunately, the long trips from point to point are broken up by combat. Though you can only attack and block at first, each one of Kingsway's classes has unique skills -- both active and passive traits -- that can turn the tide of battle. I had some success using a Rogue with an alarmingly high Agility stat. Between hyper-fast attacks, poison-tipped blades, and a passive, post-battle heal, I cut through a few crypts and slew scores of phantoms before meeting my match in the form of a legendary, fireball-slinging knight. Even after a handful of runs, Kingsway keeps impressing me. The minute-to-minute gameplay doesn't look like much at first, but as your character levels up and enemies get tougher, the game uses its arcane pop-ups to try and screw you over. Tougher foes move around the screen quickly, requiring some careful mouse movement just to land a simple attack. Sometimes enemies will toss bombs -- again, represented in a unique window -- that will explode and burn you if they don't get deactivated in time. It sounds simple, but trust me, it's a lot to handle. I can't shake the feeling that I've only seen the tip of what Kingsway has to offer. I've found magic swords and cursed boots, but something tells me that the game's biggest secrets are hidden away in the late game. I should have a few free hours at work later, so maybe I'll use that time to go adventuring.